To me, summer is all about baking with fruits. And man, I’ve got a lot of those at home. We currently have 20 (I’m not even kidding you) mangoes! After about 15 of these mangoes, you really need to do something with them because eating them plain gets boring real quick. I looked online for quite a while trying to find something creative and new. In the end, I decided to just stick to a favourite, with a little added twist. 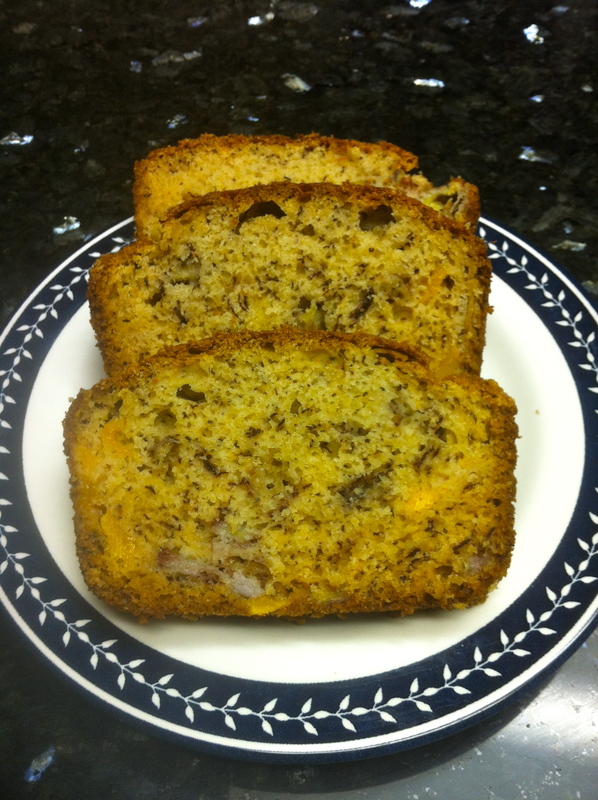 I started with my usual banana bread recipe, which, in my opinion, is perfect. 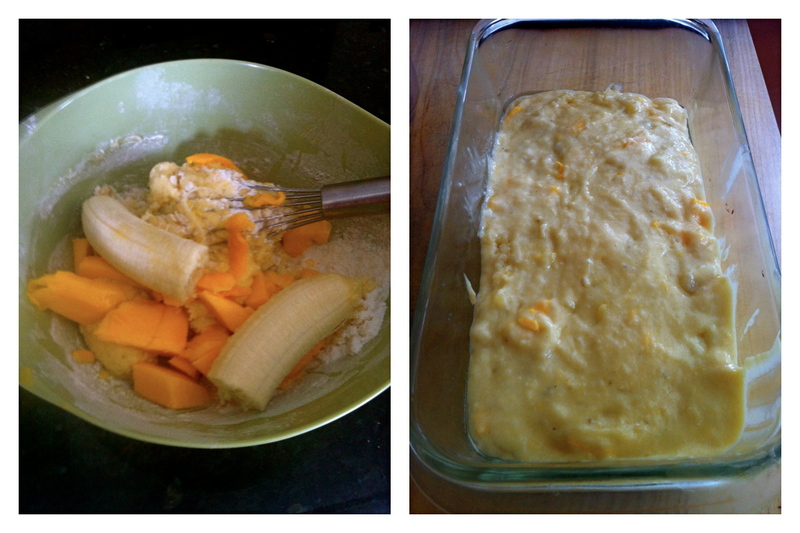 Usually I use three bananas, but I changed it to two and added in a chopped mango. This bread came out better than I expected. The mango and banana together gave it a tropical (well, as tropical as I can get at home) taste that won’t disappoint. So give it a try, I promise you’ll love it. Mix together flour, sugar, baking powder, baking soda, and salt. Add all remaining ingredients until well blended. Place in an oiled 8×4 inch loaf pan. Pinterest is an addictive thing! I’ve been pinning obsessively for the past few months, and it’s really been a great inspiration to try new recipes. 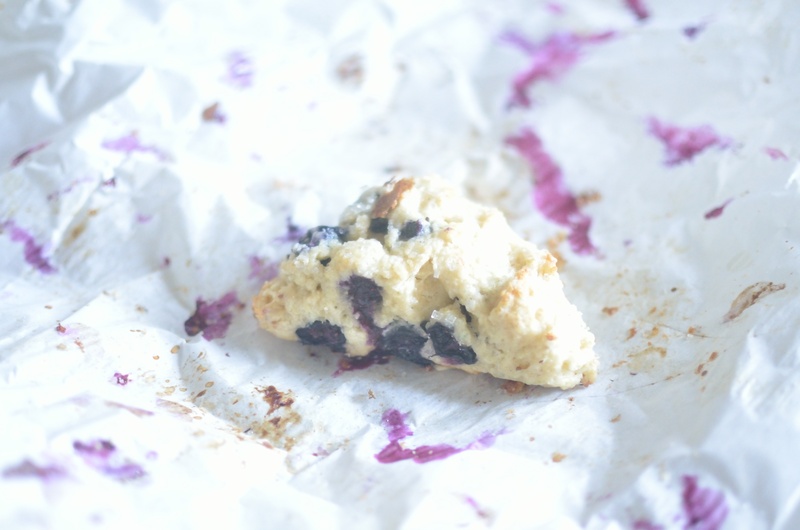 One of treats I pinned was Blueberry Scones; I know, nothing too tricky, but still! This is the first time I made scones, and I must say, they are pretty yummy. 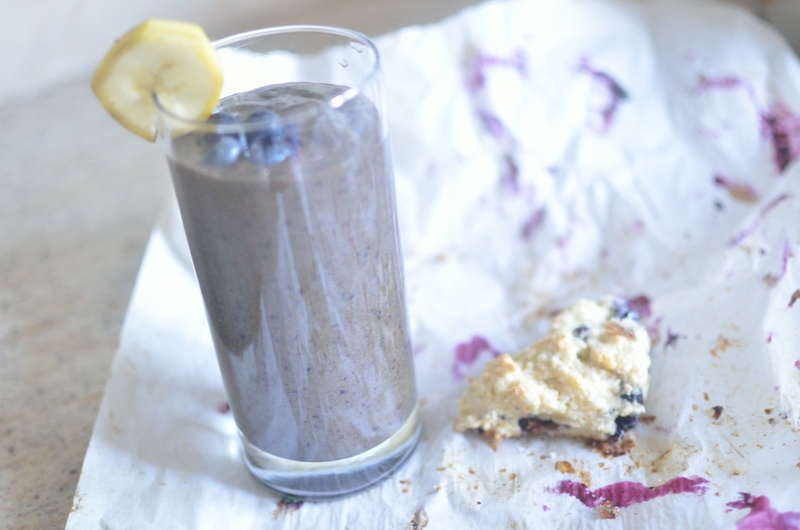 We had an abundance of blueberries at home, so I made a blueberry smoothie for breakfast to have with a scone-it’s all about balance, right? I’ve been having a smoothie every morning for breakfast for the past while, and there’s really no going back. It’s easy, nutricious, and yummy! 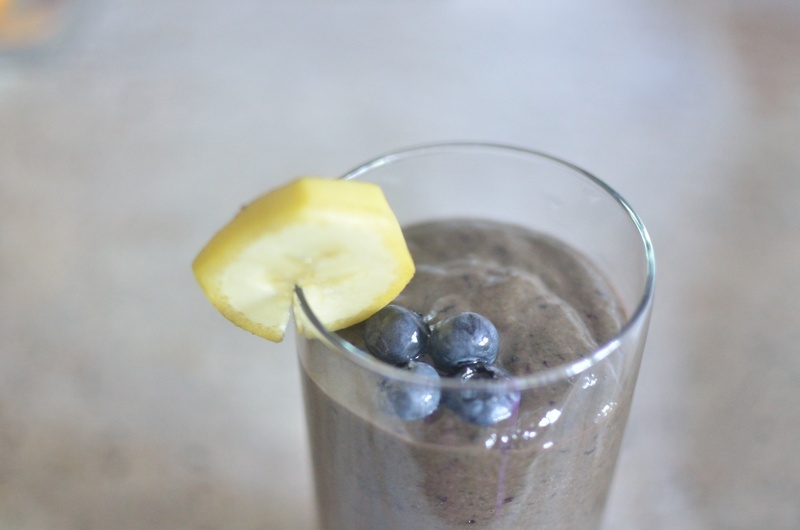 This smoothie is superrr healthy. 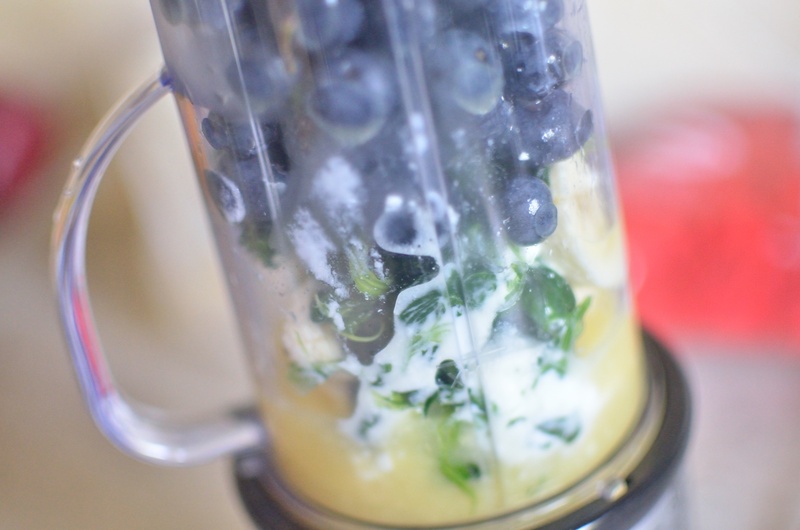 I added a cup of blueberries, a handful of baby spinach (don’t be like me, use fresh greens! ), 4 tbsp yogurt, 1/3 cup orange juice, and half a banana. Blend this together, and don’t let the colour scare you! Now for the scones, I tweaked a recipe that I found on Joy of Baking, which I included below. The original recipe included a streusel topping, which I didn’t bother with, but if you want a sweeter scone, go ahead and add the topping or some sort of glaze. Also, you can use either milk or cream for the dough, I’m sure cream would make it extremely tender, but I used milk, and didn’t miss the extra calories at all! I like mini treats, so I cut the dough into 16 triangles, and they were the right size for snacking, without making you feel like you indulged too much! They are tender, and not too sweet; the perfect accompaniment for hot coffee or tea (or a smoothie)! I also loved the look of the dark purple berries against the white pastry. 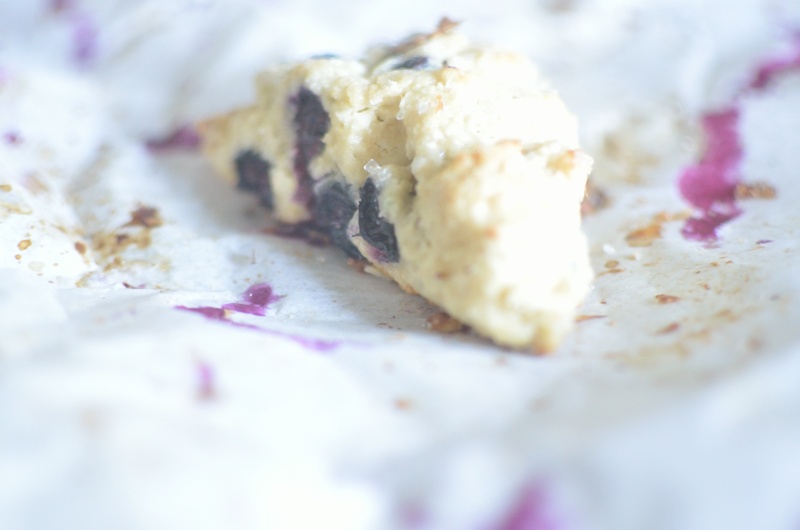 You should definitely try these simple scones, and enjoy! Preheat oven to 400 degrees F (205 degrees C) and place rack in middle of oven. Line a cookie sheet with parchment paper. In a large bowl, whisk together the flour, sugar, baking powder and salt. Cut the butter into small pieces and blend into the flour mixture with a pastry blender or two knives. The mixture should look like coarse crumbs. Gently fold in the blueberries. In a small measuring cup combine the milk, beaten egg and vanilla. Add this mixture to the flour mixture and stir just until the dough comes together. Do not over mix the dough or the scones will be tough. Transfer the dough to a lightly floured surface and knead the dough gently four or five times and then pat the dough into a circle that is about 7 inches (18 cm) round and about 11/2 inches (4 cm) thick. Cut into 16 wedges (triangles). Place the scones on the baking sheet. Brush the tops of the scones with a little cream or milk. Bake the scones until nicely browned, about 15 – 18 minutes or until a toothpick inserted in the center of a scone comes out clean. Transfer to a wire rack to cool slightly. These are best eaten the day they are made but can be covered and stored for a few days.. This was one of those days where someone was coming over and we needed a dessert, yet I was feeling lazy (summer unemployment does that to you). So I watched TV all afternoon and then an hour before guests came, I finally got off the couch. I didn’t have the time or desire to make something all that fancy, so I decided on cookies. Now, I know cookies usually aren’t dinner party quality desserts, but they can be! 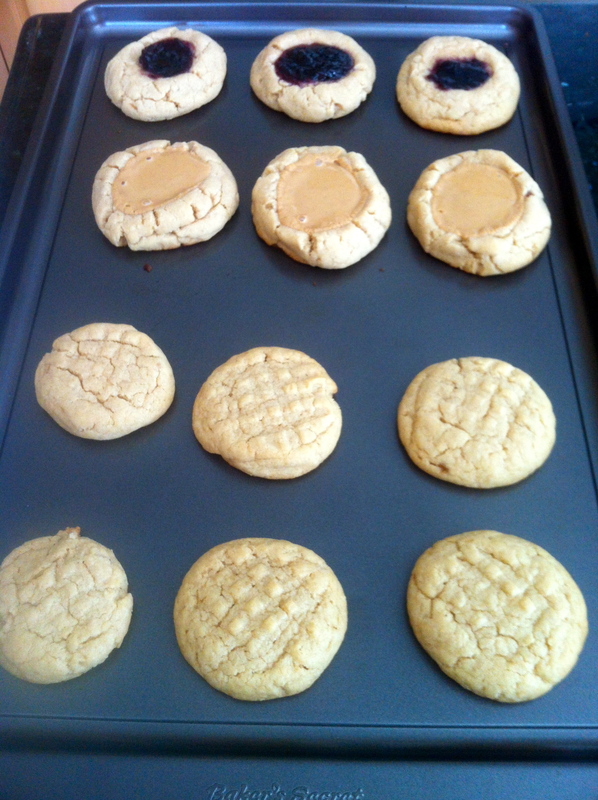 I started with my usual peanut butter cookie recipe. I made six of them, in slightly small format. Then I tried to fancy them up. I’ve made thumbprint sugar cookies before and they came out pretty cute so I decided to make some peanut butter thumbprint cookies. Of course with my luck I only had like two teaspoons of jam in my fridge and that only filled three cookies. The other three, I filled with peanut butter since by this time my summer vacation mind just couldn’t deal. This wasn’t as terrible of an idea as you may think. The peanut butter worked just fine with the cookie. Guests = impressed. Cookies at a dinner party = passable. 3. Combine all above ingredients together. 5. Roll dough into balls. Place balls on ungreased cookie sheet. 6. Press with fork dipped in water to make criss cross. 7. 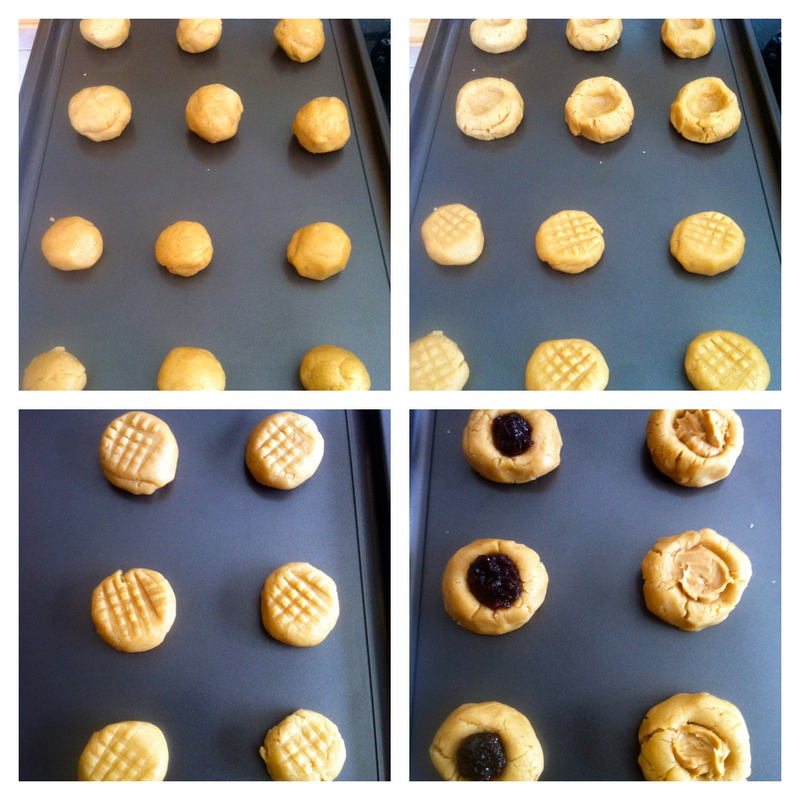 For thumbprint cookies, make a well in the centre of the cookie with your thumb. Drop in jam or peanut butter. 8. Bake at 350F for 8-10 minutes, until bottom of cookie is golden brown. Sometimes success is simply a happy accident. Penicillin, an antibiotic, was actually discovered accidentally by Alexander Fleming, when his petri dishes were contaminated by a fungus called Penicillium notatum. Science, people! 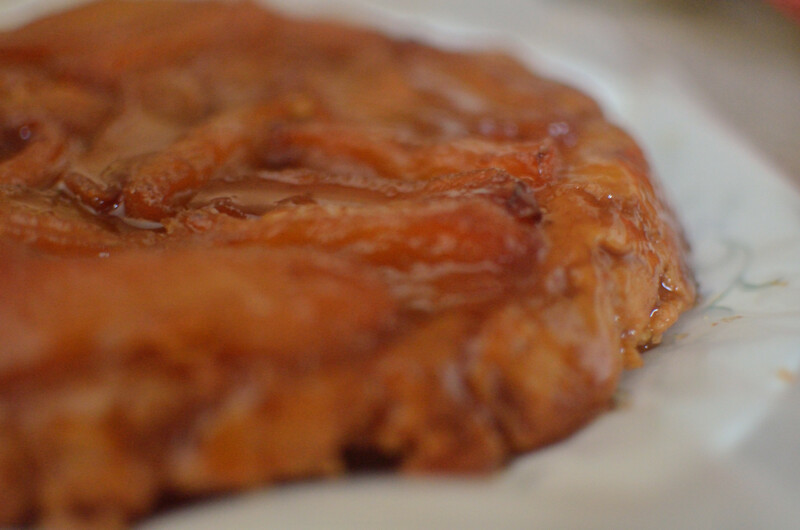 Now, in the realm of baking, this apple dessert called a Tarte Tatin was invented by mistake by the Tatin sisters in France. If it wasn’t for one of these ladies overcooking their apples, we wouldn’t have this sweet, caramel-y treat. 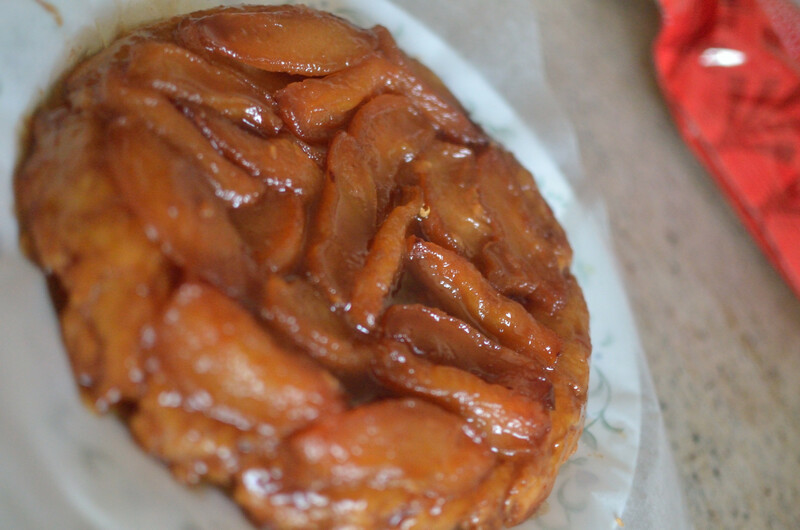 One of my friends made a tarte tatin a few weeks ago (I was lucky enough to try some) and I fell in love with it! It’s a true example of when simple ingredients and some patience come together to make something both impressive and delicious. Do you have apples, butter, flour, sugar, and about an hour on your hands? Make this. You won’t be disappointed! This recipe has two components: the crust, and the filling. For the crust, you want to make sure that the butter stays as cold as possible until the tarte tatin is put in the oven, because this will ensure that you have an extremely flaky pastry. The recipe below (from Smitten Kitchen) uses a food processor, but I strongly believe in doing pastry by hand, so I would suggest that you chill all of the ingredients for the crust in the freezer prior to making the crust. The filling is just luscious. 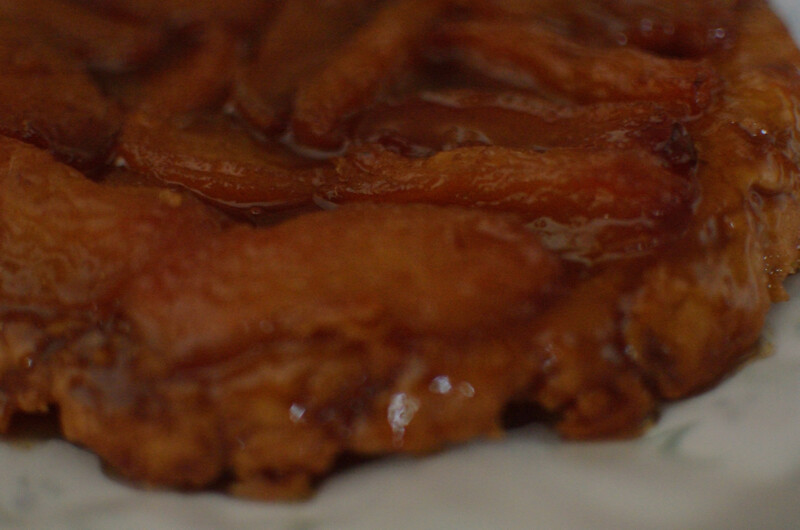 It’s a combination of apples, butter, and sugar (that’s it) and it will blow you away! I used red delicious apples, as that is what we had at home, but I believe Granny Smith and Golden Delicious are also good options. You really want to caramelize the apples in the butter and sugar, until you reach a dark amber colour, as that will take the apple flavour to the next level. Serve this warm with some vanilla ice cream, and life will be good! Prepare Crust: I always use the food processor for this. Pre-mix the flour and sugar in the food processor container, and cube the butter on a plate. Then put the dry ingredients and the butter in the freezer for a while. This will get everything, including the blade and container, nice and chilled. The colder everything is, the flakier and more tender your crust will be. Prepare about 1/3 cup ice water and refrigerate. After you’ve chilled everything for at least 20 minutes, add the cubes of butter to dry ingredients and pulse until the largest pieces of butter are no bigger than tiny peas. Add the ice water a little at a time, processing just until the dough starts to come together into a mass. (it won’t quite be a “ball,” and it won‘t look smooth–you don’t want to overprocess it!) Turn out onto well-floured surface and pat together into a ball. Don’t handle the dough too much, or the warmth of your hands will start to melt the butter. Flour the top of the dough and use rolling pin to quickly press and roll the dough out into a 10 to 11-inch circle. Keep turning the dough as you do this to make sure it doesn’t stick to the rolling surface. Throw more flour underneath the dough if necessary. 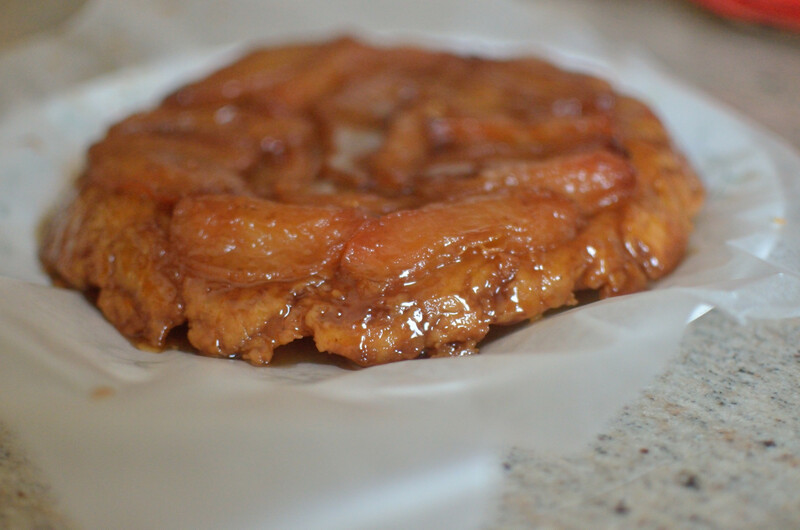 Check the crust to make sure it’s just big enough to cover the top of your tarte tatin pan. Move the crust onto a piece of parchment paper or onto a floured rimless baking sheet, cover with plastic wrap and refrigerate. Prepare filling: Preheat oven to 375° F.
Peel, core and quarter the apples. Don’t cut them into smaller pieces than quarters–the quarters shrink considerably during cooking. You can squeeze a bit of lemon on them, but it’s not necessary. Over low heat in a heavy, ovenproof skillet measuring 7 to 8 inches across the bottom and 10 to 11 inches across the top, melt the stick of butter. Remove from heat, add the sugar and stir until blended. Shake/tap the pan so the butter-sugar mixture distributes evenly across the bottom.Arrange apple quarters in pan, first making a circle inside the edge of the pan. Place them on their sides and overlap them so you can fit as many as possible. Then fill the center of the pan; you may have some apple left over. Keep at least one extra apple quarter on hand–when you turn the apples over, they may have shrunk to the extent that you’ll need to cheat and fill in the space with an extra piece. This one piece won’t get quite as caramelized as the other pieces, but don’t worry–it will still cook through and no one will notice. Return your pan to the stovetop on high heat. Let boil for 10 to 12 minutes or until the juices in the pan turn from golden in color to dark amber. Remove from heat. With the tip of a sharp knife, turn apple slices over, keeping them in their original places. If necessary, add an extra slice of apple to keep your arrangement intact. Return to the stovetop on high heat once more. Let cook another 5 minutes and then remove from heat. Place the crust on top of the apples and brush off excess flour. Tuck edges under slightly, along the inside of the pan, being careful not to burn fingers. You can use your knife. Bake in oven until the top of the crust is golden-brown in color, about 25-35 minutes. Remove from oven and allow to cool on a rack about 30 minutes. Run a sharp knife along the inside edge of the pan. 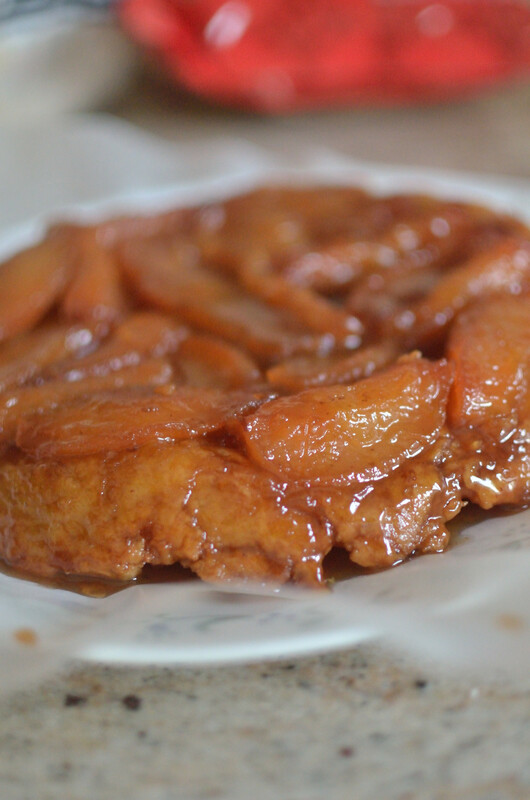 Place a plate or other serving dish on top of the pan and quickly flip over the whole shebang so the Tarte Tatin drops down onto the plate. The pan will still be hot, so use potholders and be careful! Don’t burn yourself or drop stuff! If you are feeble and clumsy, get someone stronger and more coordinated than you to do this. Peek under the edge of the pan to see if the Tarte came out. You may need to bop the bottom of the pan with your potholder-encased fist for this to happen. If there are any pieces of apple left behind in the pan or otherwise out of place, carefully put them back where they are supposed to be. Voila! A beautiful TREAT! This keeps well for about a day at room temperature; if you have to refrigerate it, warm it up slightly before serving for optimum enjoyment.